It isn't a conspiracy, nor a virus or cancer. It started 2500 years ago and is about an idea, a dystopian one. It loves to talk about equality, humanism, language, mathematics and religion but its mantle is: 'Left to Our Own Devices We Will Fall Down!' It's anti-democratic and abhors openness, reason, atheism, and law and order. It detests middle class values and the work ethic. It yearns for the unearned . . . for the easy life. It's a slow crawling killer, a hater of life, and overall, it surreptitiously rejoices in human misery. It's cure is laborious! In fact, it's the hard life itself. Modern human excellence started with the growth of rational materialism and individualism hundreds of years ago. It was another idea altogether, a demanding one; the first people to discover it were silenced by the mystics, the second wave were killed en masse by the state-collectivists. Now, we stand at the brink of a fresh onslaught: this current democratic equalitarianism seeks the final solution; an elixir as powerful as it is corrupt: the gentle kindly handmaiden state. It has joined forces with artists, religionists and collectivists to win the irrational endorsement of everything that is poisoned in life: wishful thinking, believing in things which clearly don't exist and using the force of the herd to bring about undeserved riches for people of little merit. It is sentimental and seeks to keep all things slightly out of focus for those they consider the unlearned masses--us poor suckers of the third estate. 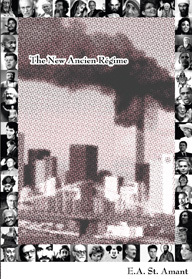 It's a movement touched with idiocy and fear; it is the modern myth of the New Ancien Régime.